Playing Oh What A Night with some deep fading. 0025 - "If You Leave Me Now"
0026 - "He Ain't Heavy"
0035 - "Long Train Running", Doobie Bros. Signal up and down, fair copy on S3 peaks. 0052 - "Alone Again, Naturally". Fades are getting longer. 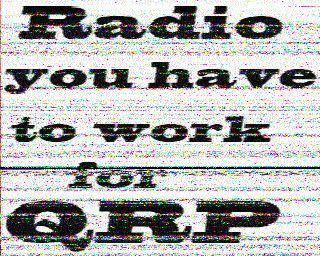 0111 - hearing some SSTV in the noise, no decode here. 0124 - off, QRO for one song I guess. Thanks for the ID @ 8 tattoos! 0038 UTC - Baker Street / Gerry Rafferty, signal S3-S5 at peaks with deep fades. 0042 UTC - Station ID but could not make it out. Announcers voice was distorted. 0121 "Go Your Own Way" Fleetwood Mac, pretty good signal here. I'm recording the band so I'll get the beginning of the show later. Thanks!